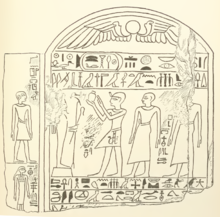 Rahotep (raising arms) while offering to Osiris. Stele BM EA 833, drawn by Wallis Budge. ↑ Wallis Budge: Hieroglyphic texts from Egyptian stelae, &c., in the British Museum, Part IV, London: Printed by order of the Trustees [by] Harrison and Sons, 1913, available not-in-copyright here, pl. 24. หน้านี้แก้ไขล่าสุดเมื่อวันที่ 3 กุมภาพันธ์ 2562 เวลา 13:41 น.